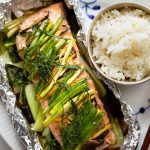 This Vietnamese-style Caramelized Salmon features salmon prepared in a classic way. The fish is simmered with fish sauce and caramel sauce which gives it a delicious savory taste and beautiful color. Served with rice, this dish makes a very satisfying meal. 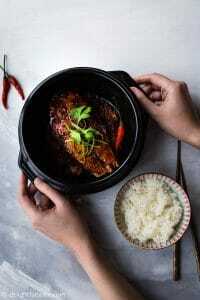 One of the most classic Vietnamese dishes is caramelized/braised fish (“ca kho” in Vietnamese – “ca” means fish and “kho” means braising). It is not a dish that you would easily find at your local Vietnamese restaurants, but it showcases traditional Vietnamese cooking techniques and core flavors of Vietnamese cuisine. There is just something very homey about this dish, probably because it is in the meal rotation of every family in Vietnam. “Ca kho” is an example of the savory dish we serve with rice in a typical Vietnamese meal. I’m sure a lot of Vietnamese people living abroad (including me) feel like home whenever they make caramelized fish. And this is also my mom’s favorite dish to eat with rice. 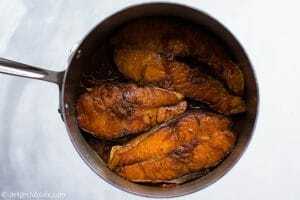 In Northern Vietnam, caramelized fish is usually on the salty side with just a little bit of sweetness. On the contrary, Southern people prepare this dish with more pronounced sweetness. 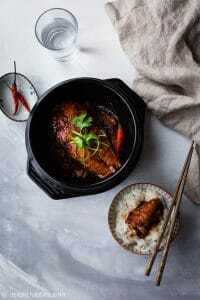 The fish sauce and caramel sauce give the fish a deep savory flavor and rich color. 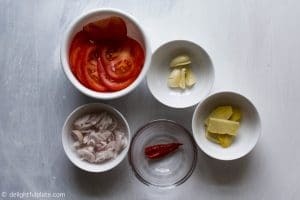 We also add aromatics and other ingredients to simmer with the fish to eliminate any strong fishiness and make the dish even more sophisticated. Some of the aromatics and items we often use are ginger, galangal, tea leaves, bird’s-eye chili, tomatoes and starfruit. Different choices of aromatics and other ingredients result in a slight difference in flavors. In terms of fish for caramelized fish, we have a variety of choices in Vietnam and each type of fish results in different texture and taste. Outside of Vietnam, I have found salmon and mackerel to be excellent for this dish. 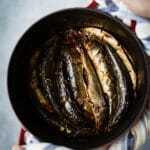 I think sardines also work. Catfish is also a popular choice, but I’m just not a fan of its texture and taste. 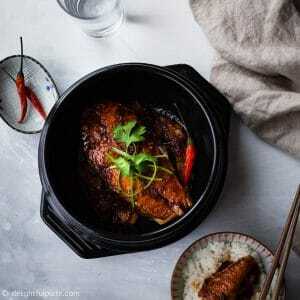 The Vietnamese translation for caramelized salmon is “ca hoi kho“. We traditionally use fish steaks to cook the dish. 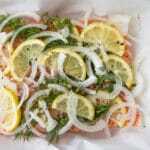 I love to use salmon steaks for this recipe. However, if you can’t find them, it should be okay to use salmon fillet. Just don’t slice them too thin/small. My recipe for caramelized salmon is Northern style. You can make it more like Southern style by adding sugar to the braising liquid to your liking. I also add the bird’s-eye chili which gives the dish a nice kick, but you can leave it out if you don’t like spicy food. Also, traditionally we don’t leave a lot of liquid left as sauce for caramelized fish, but feel free to leave as much sauce as you prefer. It’s best to serve this caramelized salmon over rice, so delicious and flavorful. I’d love to hear what you think about the dish, so please feel free to leave a comment. New recipes are added every week so let’s connect on Facebook, Pinterest and Instagram for the latest updates. 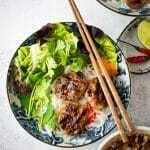 You can find my collection of Vietnamese recipes here. Thinly slice shallot, ginger and tomatoes. Smash the garlic. Remove seeds from the bird's-eye chili. Set aside. In a small saucepan, add 2 tablespoons of sugar and 2 tablespoons of water. Bring to a boil, the sugar will fully dissolve. Lower the heat to medium, continue to simmer. You will see that a lot of bubbles on the surface. The mixture will then turn from clear to yellow, and get darker as you simmer it. When it has a honey color, reduce the heat slightly. Keep watching closely, until it has a dark caramel color, turn off the heat and carefully add 1 tablespoon of water. Swirl the saucepan to combine (add 1/2 - 1 more tablespoon of water if the caramel sauce is too thick) and remove it from the stove. Set aside. In a pan over medium high heat, sear salmon steaks for 2-3 minutes each side or until golden. Transfer them to a plate. Place a pot that can fit all the salmon in a single layer on medium heat. Add oil and sauté shallots for a few seconds Add garlic and ginger and sauté for a few more seconds until fragrant. Arrange them to cover the bottom of the pot and place tomato slices on top. 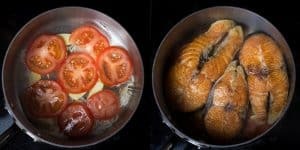 Place salmon steaks on top of the tomatoes. Add 1 1/2 cups of water or enough to cover the fish, add fish sauce, caramel sauce and bird's-eye chili and bring to a boil. Lower to a simmer (low - medium low heat). Sprinkle plenty of black pepper and simmer 10 minutes then gently flip the fish. You can taste the braising liquid and adjust to taste, but remember it will get saltier as we continue cooking and reduce the liquid further. 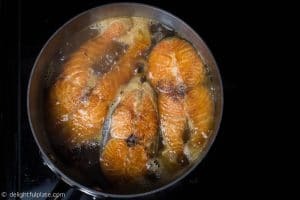 Continue to simmer for 20-30 minutes, flip the fish one (or two) more time. Occasionally spoon the braising liquid over the salmon. If the liquid reduces too rapidly, you can add a little more water. In the last 5-10 minutes of cooking, watch closely because it may burn. The liquid will reduce, thicken like a sauce. Turn off the heat when there's just enough sauce to coat the bottom of the pot (or sooner if you prefer more sauce). Transfer salmon to a shallow serving bowl and sprinkle some more black pepper. Serve with rice. When making the caramel sauce, once the mixture turns yellow, you should watch very closely. Don't go anywhere because from that point, it can burn really fast. 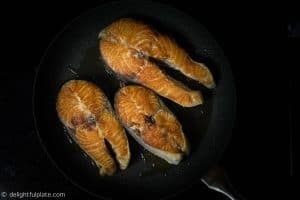 My recipe for caramelized salmon is Northern style. You can make it more like Southern style by adding sugar to the braising liquid to your liking. I suggest start with 1/2 teaspoon of sugar, taste and adjust to your liking. The bird's-eye chili which gives the dish a nice kick, but you can leave it out if you don't like spicy food.